Yellowstone National Park, WY– May 6, 2017 – Michael Keller has been hired as General Manager of Yellowstone National Park Lodges, operated by Xanterra Parks & Resorts. 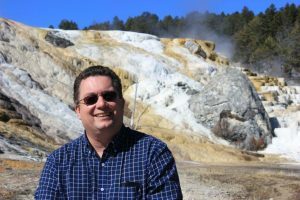 Keller is no stranger to Yellowstone, having earned a 28-year career here and at Crater Lake National Park with Xanterra prior to taking on the general manager responsibilities for the Grand Canyon and Tusayan operations under the auspices of Delaware North. Keller began working in the hospitality industry in 1987 and has spent the majority of his career in National Parks with a brief interlude working for Red Lion Hotels in Kalispell, Montana, and Seattle, Washington, in the mid-1990s. During his time as the Executive Director of Operations in Yellowstone, Keller received his CHA. Known for its “Legendary Hospitality with a Softer Footprint,” Xanterra Parks & Resorts® entities include lodges, restaurants, tours and activities in national and state parks, as well as resorts, a cruise line, railway and tour companies. Xanterra Parks & Resorts has operations in Grand Canyon, Yellowstone, Zion, Crater Lake, Glacier and Rocky Mountain National Parks; Mount Rushmore National Memorial; Furnace Creek Resort in Death Valley National Park; and five Ohio State Park Lodges as well as the Geneva Marina at Ohio’s Geneva State Park. Xanterra Parks & Resorts also owns and operates the Grand Canyon Railway and Hotel in Williams, Ariz., the Grand Hotel in Tusayan, Ariz., Windstar Cruises, Holiday Vacations, VBT Bicycling and Walking Vacations, Country Walkers and Austin Adventures. Xanterra is also affiliated with two Five-Star Resorts, The Broadmoor in Colorado Springs, CO and Sea Island on the coast of Georgia.